This abandoned grain elevator, in Elva on the CPR Estevan Subdivision in the Rural Municipality of Two Borders, was built by the Manitoba Elevator Commission in 1916 using materials salvaged from two elevators that had previously stood here. One had belonged to the Dominion Elevator Company and the other was owned by the Western Elevator Company. Both were purchased by the Commission in 1910. 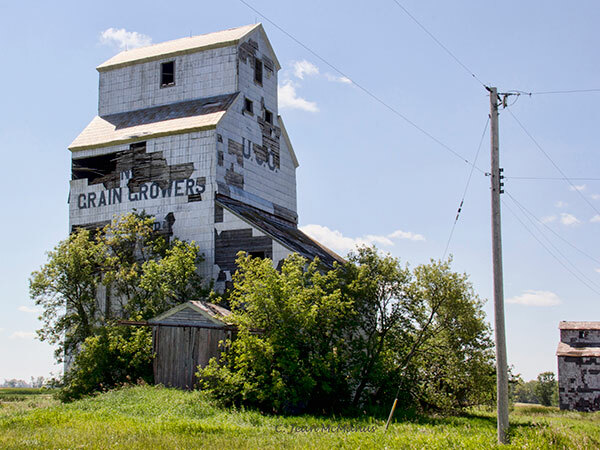 Two years later, the new elevator was leased to the Grain Growers Grain Company and bought outright in 1926. It was sold in 1958 to the newly merged Ogilvie Milling Company and Lake of the Woods Milling Company, which sold it the following year to Manitoba Pool Elevators. It closed in July 1967 and was sold to private interests. History of United Grain Growers Local #162, Melita, Box 59, MSS 76, UGG Fonds, University of Manitoba Archives & Special Collections.